Will the Codes Abolish Child Labor? Editor’s Notes: (1) In 1933, President Franklin D. Roosevelt signed the National Industrial Recovery Act into law. Under the NIRA, a regulatory body known as the Cotton Textile Board was established to enforce a code of fair competition for the industry. The code’s purpose was to limit destructive price competition among manufacturers, prevent the over-production of textile goods, and guarantee mill hands a minimum wage. The Cotton Textile Board was controlled, however, by mill owners, and in practice, manufacturers often turned the code of fair competition to their own advantage. By “stretching out the stretch-out,” they effectively turned the minimum wage into the maximum that most workers could earn and laid off thousands of additional hands. (2) This entry is an article Ms. Zimand published in The Survey, August, 1933. A biographical entry about Ms. Zimand can be found under the tab PEOPLE. WHEN President Roosevelt on July 9 signed the Code of Fair Competition for the Cotton-Textile Industry, which bars from employment children under 16 years, he virtually removed from that industry several thousand children who will be replaced by adults. Had this action been taken in the spring of 1930, before unemployment became so acute, the number displaced would have been over 10,000. If all of the clothing industries adopt a similar provision, which is expected, another 8650 children will yield their places to older workers. In this case, the Census figure is probably fairly representative of the number of children now at work, for with the sweatshops which have sprung up since the depression, an actual increase in the number of children employed was reported last year in several cities which are strongholds of the garment trades. One of the primary purposes of the National Industrial Recovery Act is to increase employment opportunities. For this reason, if for no other, a 16-year-age minimum should be incorporated in every code. All of the important child-labor industries that have definitely submitted codes have done so, and President Roosevelt’s blanket code, which is operative only until December 31 and which depends upon voluntary acceptance, specifies a 16-year age minimum except for non-manufacturing industries where children 14 to 16 years may work for 3 hours a day. A real point of danger, however, lies in the agreements to be submitted by the retail trade groups. Although more than 25,000 children under 16 years were employed in stores in 1930, and 15 percent of these were under 14 years, the code originally drafted by the National Retail Dry Goods Association, which it was said would probably be a model for other retail groups, contained no age minimum. Moreover, it specified a decidedly lower wage-rate for junior workers under 18 years than for adult workers. In such industries, where for many processes a very short period of training is required, a wage differentiation based on an arbitrary distinction of age is bound to result in the employment of low-paid juvenile labor to replace more highly paid adult labor, thus defeating one of the fundamental purposes of the Recovery Program. This industry is now reframing its code, and the new text has not been made public at this writing. The Detroit Retail Merchants Association, it is interesting to note, has already protested to General Johnson against the blanket code in its application to mercantile industry and has asked that lower wages for junior employees be considered. The industrial codes can at one sweep temporarily abolish child labor in most of the industries of this country. Allowing for a 25 percent decrease since the 1930 Census was taken, fully 100,000 children would be released for school and their jobs made available for adults if a 16-year age minimum were incorporated in all codes. The 400,000 children regularly employed on their home farms will not be touched by the codes, and whether the 67,000 young wage-workers in commercialized agriculture, the 23,000 newsboys and bootblacks, and the 40,000 domestic workers will be affected is likewise doubtful. However, the mere inclusion of a 16-year age minimum is not sufficient for all industries. Not only the 14- and 15-year-old coal-mining operatives, of whom there were 722 in 1930, should relinquish their jobs to adults, but the 15,182 boys of 16 and 17 years as well. The code of the bituminous coal industry, however, provides merely that children under 16 should not be employed “inside a mine.” Undoubtedly the 3,181 children under 16 should be taken out of the sawmills, as the lumber code already submitted to the National Recovery Administration stipulates—but every one of the 15,736 workers who are under 18 years should also be removed from this hazardous employment. The general public, as well as the men who get their jobs, will be relieved if the 15,219 “chauffeurs, truck and tractor drivers” who are under 18 years surrender their drivers’ seats to older men. And the railroad tracks are no place for the 5,665 boys under 18 who are working upon them as “laborers.” Nor is there any place in our blast-furnaces and steel rolling-mills for the 4,973 boys under 18 who were so employed in 1930. 1. Age minimum. A 16-year age minimum should be included in every industrial code and should apply to all types of employment in the industry; for industries, or specific processes in industries, where unemployment is especially severe or where the risks of employment make advisable adult workers, an 18-year age minimum should be specified. 2. Apprenticeship. The employment of learners or apprentices should be strictly regulated as to the number permitted, wages, and length of the “apprenticeship” period. 3. Wage-rates. Wage-rates for junior workers should be based on the capacity of the worker relative to adult capacity, and not on an arbitrary age basis. If these principles are fully incorporated and the codes are effectively enforced, child labor will be eliminated from the major industries of the United States for the two-year period of the emergency. But this does not mean that the child-labor fight has been won. Considerable pressure was brought to bear before industry “voluntarily” moved to eliminate child labor,—not all industries have done so yet—and this action cannot be too literally construed as indicating a change of heart which will keep children out of industry when the restrictions imposed by the codes cease to operate. When employers are once more free to fix their own wage scales and conditions of work, “cheap” child labor may again become profitable. Previous experience indicates that when a period of unemployment begins to abate and industry picks up, the number of children entering industry tends to increase. And there is ample evidence that when federal control of child labor has been exercised and is removed, its effect likewise vanishes! When the first Federal Child Labor Law was declared unconstitutional, there was a prompt restoration of a longer working day for children and an increase in the number of such working children. Moreover, between 1920 (when the second Federal Child Labor Law was in effect) and 1930, when there was no federal regulation of child employment, the number of children employed in textile establishments in South Carolina and Georgia actually increased by 23.7 and 11.9 percent respectively. Child labor is an evil at any time. The depression has brought to the fore the economic unsoundness of employing children while adults are idle, but from the humanitarian point of view, there will be need for child-labor control long after the depression has passed. 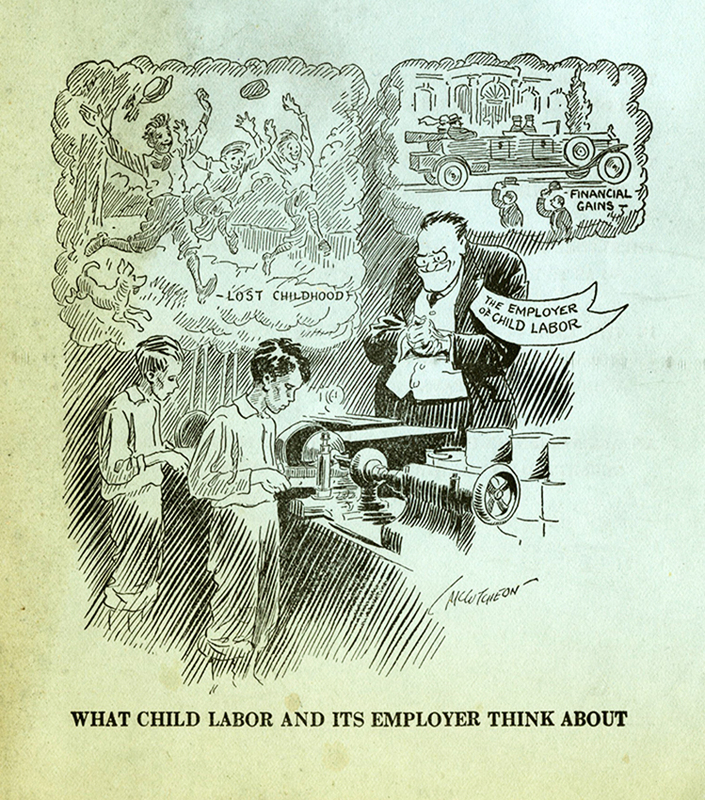 The National Child Labor Committee is therefore working simultaneously for the inclusion of a child-labor provision in every emergency industrial code, and also for ratification by the states of the Federal Child-Labor Amendment as the only method of making permanent the improvement in child-labor standards which may result from the National Industrial Recovery program. Fifteen states have now ratified the Amendment—nine of them during 1933. Efforts for ratification cannot be relaxed. We must press on toward the goal of ratification in thirty-six states by 1935 so that a federal law can be enacted as soon as the codes cease to operate and child labor can be eliminated once and for all. http://newdeal.feri.org/survey/s338.htm. New Deal Network, http://newdeal.feri.org (March 8, 2014).